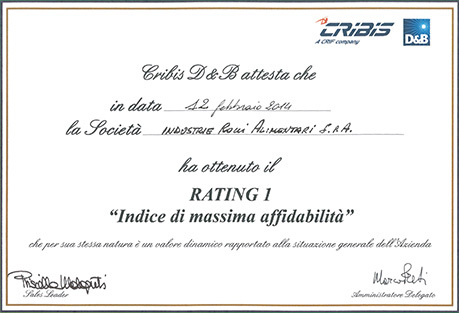 the "Rating 1 - Index of max reliability" by D&B, a group born from the strategic alliance between CRIF, a specialist in credit information and decision support systems, and D&B, a world leader in the sector of business information with more than 168 years of experience. The D&B Rating 1 is the indicator of the economic and financial stability and the timeliness in payments of a company: a high value recognition that, in the last year, has been given to less than 6% of the over 5 million Italian companies! This important certificate repays the managerial commitment and the professionalism shown to customers and suppliers over the years, whose Industrie Rolli Alimentari SpA has become a solid business partner.